As humans, it is a part of our nature to make mistakes even when we try to take extra care in preventing them. These kinds of errors and mistakes unknowingly creeps into most of our works. Even if the employee is diligent and is a perfectionist, this doesn’t mean that he is not prone to errors. It is common for everybody to make a mistake. 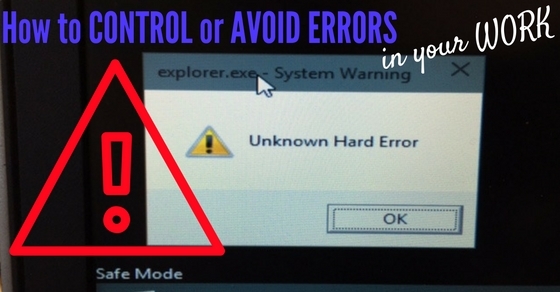 Hence, to avoid errors from happening, the best method takes extra caution in fields that you are prone to get errors. This comes under quality improvement of your work. The best method to avoid mistakes at work from happening is to face these errors with a positive attitude and an excellent skill level. Mistakes at work are common, but if the same ones are repeated then it is not something worth encouraging. Mistakes can lead your work level down and can act as a hindrance in the way of your success. So it is always important to avoid mistakes or errors at work. In this day and age, most people are interested in doing multitasking than getting a single job done with perfection. This can lead to the employee overlooking the critical and crucial part of the job. Multitasking is good, but jumping back and forth between jobs can be distracting to an employee who is not used to. The best method is to do one job at a time, with a good speed and having an eye for details or mistakes. Dedicate a good amount of time for the given task. Try to give your full attention to what you are doing. This also means eliminating other forms of distractions or obstacles along the way. This way you can do your work efficiently and complete it with ease without much errors. Moreover, you will still get time to take a quick look at the finished work and search for errors. The main reason why most of the employees do critical errors in their work is because they are either too afraid or their ego won’t let them allow to ask the most important doubts about the work given. They are more focused on what people will think rather than asking a doubt for their satisfaction. Always try to ask whatever comes into your mind. This can help you learn more about your task and can help you to complete your work more efficiently with a clear understanding. If you are unsure about the next step that should be taken while doing a task, try to ask doubts to your higher-ups or your fellow colleagues. This helps you to get the necessary information in doing the job and also, they might be even willing to help you to guide through the steps. Always try to remember that every challenge that you face is a chance for you as an employee, to learn something new. So, try to efficiently use the resources that are available to you, and give your best in every way possible. Checklists helps you to keep in track of all the steps that you do while completing a task. This helps you to check what all procedures should be done before you publish or submit a work. If you are a person interested in multitasking, then it is a necessity to always prepare a checklist so that you won’t get lost while doing multiple jobs at a time. Try not to do anything incomplete or undone. Checklists are a great method to generalize the overall steps needed and gives a good idea of what all should be done. This helps you to minimize errors in the overall process and make it easier for you to review the final work. This is necessary if you are a multitasker who has to get lots of things done. As mentioned earlier, errors will always creep up unknowingly in your work, even if you are a diligent employee. A good method to prevent this is to carefully review your work. An error-free work should always be the top priority of an employee, and constant reviewing helps you to achieve that. Always review your work before you publish, submit or present it in front of a client. Most often employees submit works having a huge amount of errors because they were completing it against a tight deadline. Always make time for reviewing, even if it is against a tight deadline. This helps you to improve the quality of your work, even if the quantity is not enough. This is also a good method to impress your higher-ups and show that you always try to give the best results even under pressure. If you have completed a work after spending hours and hours trying to perfect it and is in a finished state to show it to the clients, always take a break and try to review the whole work again. Reviewing your work after taking a rest, helps you to avoid mistakes at work that you might have been overlooked. This can be more efficient if you review the work using a good checklist. Even if you have tried your best in getting a job done and made sure that there are no mistakes, some mistakes are bound to happen. Always try to review your final work with the help of a more experienced supervisor or colleague. Getting a second eye is always a good method to improvise your work and the methods done in completing a task. Also, they will help in finding overlooked errors and mistakes that might have been ignored by us in a hurry. Try to get an opinion about the final work from them, most of them will provide you with suggestions on how to further improve your work. Try to note down such suggestions and try to incorporate those in the final work. As an employee, try to find your work style. Try to determine whether you are more suitable for working in a relaxed environment or in a tight schedule. Always allow enough time for your work so that you can complete your work within the given deadline and also have enough time to review the final work. Failure to do so would lead to incompetent analysis and poor work which will lead to failure in meeting the desired requirement from the employer. To prevent this, always try to estimate the required time in completing a task. The time needed should also include time to do the necessary review. The whole process should include time for researching about the work, studying for the work, collecting information, completing the work, doing a review and getting a second opinion from others. This can help you to complete the work with required speed and also produces a near to perfect outcome. When you have made a mistake at work, instead of blaming it on others, try to take responsibility for what you have done. As an employee, always try to be open towards mistakes and learn from your mistakes as well as from others mistakes. Try to make note of all the mistakes that you and your colleagues have done and try not to repeat such mistakes. Try to learn from your mistakes and others as well, and try to better your work from the lessons learnt. Always show a positive attitude towards mistakes, they are merely a stepping stone for you to learn. Try not to think of mistakes as an obstacle. But in turn, treat them as an opportunity to learn new things and try a new approach to complete a work. Making mistakes at work is usual but taking precautionary methods to avoid mistakes at work it is mandatory. A great way to improve the quality of your work and to prevent further mistakes is to find the root cause of the mistakes being made. Try to identify the source problem and try to clear it at the root itself. Try to think what all measures can be taken so as to prevent these mistakes and what can be done to further such mistakes in the future. If a clerk incorrectly numbers the materials in a store or a warehouse, then lots of problems can arise. Try to address the true source of the error and not just the consequence. A person who is afraid to try new things will not grow intellectually and emotionally. Try to take initiative in learning new things and also try to learn about the changes in society, in the field of technology and in relative areas of work. You can incorporate this new knowledge into your work so as to achieve a good result and try to learn from it. Trying new methods will also result in an increase in productivity and a rise in the quality of the final work. Mistakes can also arise not only from oneself but also from others, this might be due to conflicts between colleagues due to their clashing egos and opinions. Try to have a healthy relationship with one another and work with each other to find the solution of the problem amicably. Try to be friendly and give others an impression that you are easy to work with. Try to be clear of what your goals are and where your position is within the organization. Always try to be sure of what roles and responsibilities you have while doing a job. Try not to be undefined and vague of what you are supposed to do in your task assigned and also be clear of what you are supposed to do in your job. Failure of recognizing these factors can lead to a poor work culture along with inefficient and inadequate results from the employee. Instead of doing a large job by yourself, try to divide the task given to you into smaller tasks, and try to individually complete those tasks within a given amount of time. This approach should be taken after proper planning on how the job should be done. This also reduces the stress and the pressure that the employee has to face while completing a large job under a tight deadline. While doing a work if a problem sticks out, instead of spending your whole energy on that certain problem, try to focus what your task calls for. Try to prioritize between tasks and problems. This helps you to concentrate on the original task and its results instead of wasting time on a part of the problem. This is a useful method for managing time while doing a task. This also prevents indecisiveness from the employee’s side. Instead of doing work in your own way and making many blunders and mistakes, try to follow a certain standard and protocol while doing a task. This helps you to pinpoint out mistakes from your work, while comparing your work to the ideal standard. Try to use templates and examples and learn from them on how to do a task ideally and meet the requirements of the supervisors. If you are working within a team, try to coordinate your work with other team members and try to see if everybody is doing work with a constant standard. This helps you to avoid redundancies with your work as well as in others work. Communication can be a great factor in achieving this result. Companies should try to create a better workplace which can inspire employees, boosts creativity and also avoids all kind of distractions that can be one of the reasons for unintended errors. The companies should be welcoming and pleasant so that employees can work easily with any kind of problems or disturbance. This can slow the work and can hinder the productivity rate. Try to accept and solve mistakes that happen in your work as soon as possible, as they can have a serious consequence on the company and the client and can even damage your career. Try to be agile and diligent in your field of work and try not to repeat the same mistakes over and over again as this can be seen as incompetency from your side to the employer.